Another week finished in Peredo. 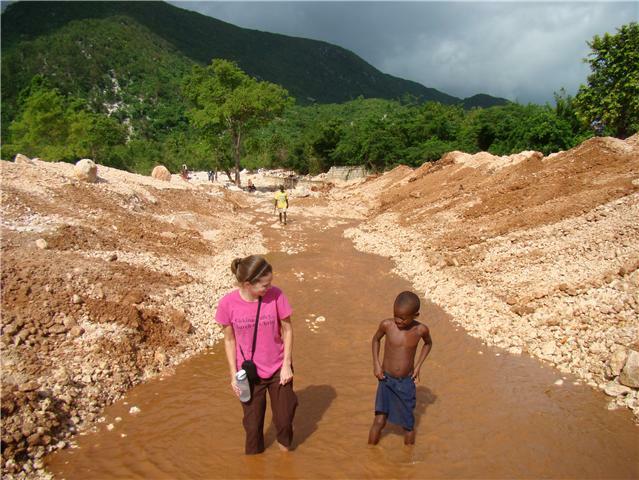 Peredo is the place in southeast Haiti where Haitian Christian Outreach has a church and school and is building a church camp and a medical clinic inthe future. There was a team of Americans down to do construction work on the camp this week. They were a lot of fun and hard workers. While they worked I took pics, went to the school and talked/played with the kids, and walked around the area meeting people. I did some "house calls" to a couple of the families in the area. There is a little girl who is 4 years old that goes to the school in Peredo. He name is Kaitla. She is adorable and deep down became my favorite quickly. Talk about a spunky, stronged willed 4 yr old! I have a feeling I was somewhat like that when I was 4. She asked me to come to her house after school and after nearly falling over b/c I actually understood her (my creole lessons are starting to pay off), I told her I would. I walked to her house my myself after school that day. I was surprised to find her in her underwear outside the house eating a little fish. I hope it was cooked! She said it was a sardine. I was invited in to the yard by her grandmother and soon found out that Kaitla's mother works in the Domincan Republic and comes home every once in a while and sends money home, but Kaitla lives with her Grandmother. After I asked Kaitla where her clothes were her grandmother jumped up and snatched her inside the house. I didn't know what was going on and wondered if I said something wrong in Creole. But a few minutes later they both came back out dressed in their Sunday best. Grandma started giving her a wipe down with the only water they had there at the house in a 5 gallon bucket. Then she steered Kaitla over to me and I told Kaitla how nice she looked. We talked for a while with as little Creole as I know how to say and then I left-only to see that Kaitla was coming with me. I figured I kinda asked for it so I let me tag along. Then I went to the next house. It is the house of Genio who is one fo the guys that drives the big dump truck and other trucks for the mission. I knew he was working with the others at the work site so I took the oppurtunity to go talk with Madanm Genio. She is the sweetest lady, kinda quiet and was surpised at my visit. I sat with her while she cooked. She was cooking rice and potatoes over a charcoal fire. The chickens were running around, the dogs kept trying to get in the food and then her 9 month old started crying as he woke up from his nap. We were talking in Creole-well I was talking and she was usually laughing at my mispronounciations! I was sitting there looking at the food she was cooking wondering what my mom was cooking back home and I got a little homesick but then I thought about the awesome experience I was having. I was sitting in a 3rd worled country watching how a woman is cooking and providing for her family first hand. I said back and took it all in. I wish I could fully describe it to you but I can't. I was going to ask her if I could take a picture but I felt like that would ruin it. I was really seeing into her daily life. I couldn't help but wonder if she would sit and stare at me cooking at my house. I saw Madanm Genio 2 days later and she responded to me differently than she did before I spent some time with her at her house. She was warm and inviting and probably waiting for me to say something else wrong in Creole! Here are some pics of the progress of the work in Peredo-those of you who have been here working on it should know that it is going well. And I want you to be able to see the progress. Enjoyed reading the latest update! I know sometimes it takes a few days before you update the comments so wanted to make sure we wished you a Happy Birthday!!!! Ginnyism #6 (from Brenton) He said you told him which cookies he could eat on New Years Eve. He said you found the cookies without nuts on them for him. Kind of hard to quote, but I guess you'll be the judge of how accurate our 5 year old is. Showed them the Sunday school picture and they both remembered Aunt Ginny's name. Braydan said "she can babysit all of those kids all by herself?" Have a great week and enjoy your last birthday in the 20's! (if my math is right).